I've always been a loyal Suave personal care products buyer. I totally agree with their philosophy that you can look and feel beautiful "without paying the price". My kids use only Suave Kids shampoos, conditioners and body washes because they cost so little (this is especially important since my kids tend to get a little overzealous when they shower, and have been known to use up a quarter of a bottle of body wash in a single session!) and smell so great. I love smelling their clean, berry/watermelon/apple-scented heads and bodies! I even use the Suave Kids products myself sometimes! As a busy woman, you know how important it is to catch a moment of bliss in an otherwise hectic day. Whether singing your favorite song, enjoying a piece of chocolate cake or relishing the rejuvenating fragrance of your favorite body wash, everyone can use a moment to recharge during the day. That is why Suave® Body Care is encouraging women everywhere to take time out of their busy day to catch a moment of bliss with NEW Suave Naturals® Mango Mandarin Refreshing Body Wash. Infused with mango and mandarin extracts, along with skin conditioning Vitamin E, this body wash revitalizes the senses and energizes with lively citrus and fruity fragrance bliss. It makes Bath & Body Works® smell way overpriced! I wish it were 2100 and everybody had personal computers that deliver scents to users when they click on something on the screen -- because then I'd be able to show you how wonderful this body wash smells. Until then, you'll have to rely on my word -- and through my giveaway below, one lucky person will get a bottle of this stuff to smell as often as he/she wants! I can't really find anything I dislike about this product! Maybe the cheap-looking packaging? Nah, I'm happy they don't bottle this in some chi-chi looking bottle and pass the high cost on to me. Look past the packaging, people -- Suave Naturals offers a blissful, aroma-filled showering experience at a low cost! It's the best indulgence ever for practical people who like to give themselves a treat. 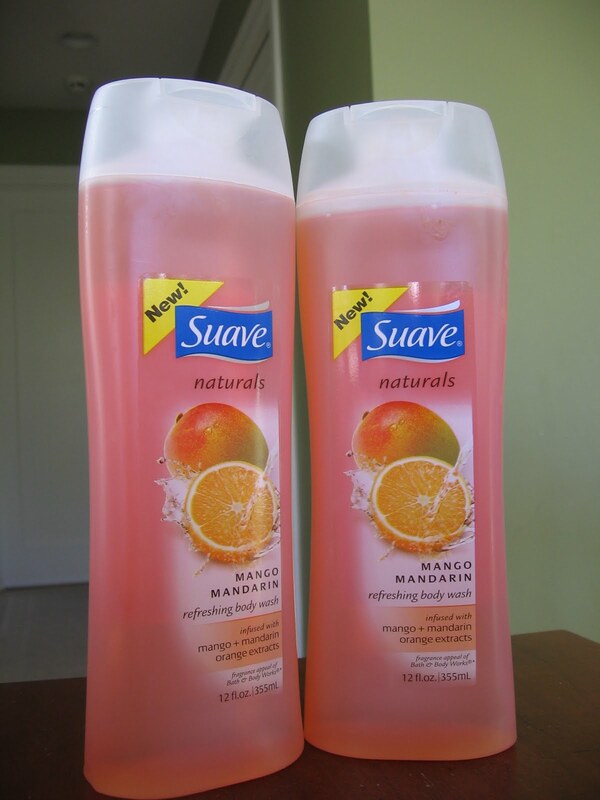 Win a bottle of Suave Naturals Body Wash! MomSelect has provided me with a second bottle of this yummy-smelling Suave Naturals Mango Mandarin body wash to give away to one lucky Bonggamom Finds reader! To enter, leave a comment on this post and tell me your favorite body wash scent. 1) Follow Bonggamom Finds on Networked Blogs (leave a comment with your FB id). 2) Fave Bonggamom Finds on Technorati (leave a comment with your Technorati id). Maximum of 5 entries per person. This giveaway ends at midnight PST on May 21, 2010; I will draw a winner at random on may 22 and post the winner's name after the winner confirms acceptance. For additional giveaway rules, click here. Good luck! Disclosure: I received a bottle of Suave Mango Mandarin body wash, and a second bottle to give away, but was not paid to review the product or give my opinions. Unless clearly stated, the views and opinions expressed here are my own. I love sweet pea and violet! My favorite scent is cucumber melon. Thanks. My favorite has always been raspberry. I love the smell of Pina Colada! I'm partial to a light citrus smell... this sounds great! I joined the American Idol tshirt giveaway. I love coconut sented anything! My favorite body wash scent is anything fruity! Grapefruit or anything fruity is my favorite body wash scent! I entered your C&H Visa giveaway! I love anything with a coconut scent. I'm definitely a body wash with coconut scent kind of girl. But pomegranate is also really good. I also entered the How to Train your Dragon videogame giveaway. I love peach and mango, so this is great for me! I love lemon, grapefruit, and orange scents. I like fruity scents in the shower! Vanilla is a great scent! My favorite is the Tropical Coconut! Chocolate Amber; a discontinued scent from B&BW. My favorite body wash scents are watermelon and strawberry. My favorite scent is Cucumber Melon. I love anything grapefruit scented. Thanks. Christina - xristya@rock.com - I love Lavendar, which has been soothing to me ever since I was a little child! My favorite scent is Lavender Vanilla. I really love anything that smells even just a hint like coconut. And I love citrus and peach scents too. I love anything with lilac or rose scent! I like the Citrus(grapefruit) scent. My favorite scent is grapefruit. My favorite scent is honeydew melon. Thanks! I entered your $20 Visa giveaway! My favorite body wash scent is anything with vanilla. I like tropical scents like coconut. My favorite scent is vanilla, but I love a bunch of others as well! I love ocean scent body wash! My favorite scent is cucumber melon. Thanks! I love mango scent. I'm strange that way. Thanks for the chance at winning. I like the raspberry. Always has been my favorite. Believe it or not, Mango Mandarin is my favorite. I have bodywash and lotion, and love it. The Suave Wild Cherry Blossom is dreamy. I'm anxious to try the Mango Mandarin. Thanks! My current favorite is Buttercream Frosting by Jaqua, but I would love to try something new too. Thanks for the giveaway...my wife & I like anything with Tea Tree Oil ! I love a cucumber scent. I like vanilla. It always leaves a fresh scent. Thanks for the giveaway. This giveaway is now closed. Thanks to everyone who entered, and congratulations to the winner: #10, tintinalex!